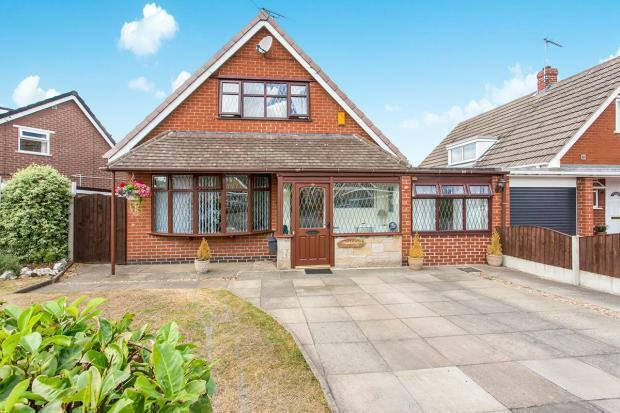 3 Bedroom Detached House For Sale in Stoke-on-Trent for Offers Over £225,000. OPEN DAY 10th & 11TH MAY. PLEASE CALL THE OFFICE TO BOOK YOUR SPACE!This delightful three bedroom property is very well presented and offers spacious and versatile living, complete with a south facing garden and a semi rural location. This home is ideally located for the local primary school, canal walks and local amenities. This beautiful family home boasts a white high gloss fitted kitchen, extended dining room, lovely spacious living room, three piece bathroom, three good sized bedrooms with the ground floor having a superb guest bedroom with a great en suite wet room. Ample parking to the front of the property for multiple vehicles and a generous lawned garden to the rear, this home is a must view! Solid hardwood entrance door. Stairs to first floor. Hive control unit. Laminate oak style flooring. Radiator. Lovely light room with a sollid hardwood double glazed bay window to front elevation, Inset living flame open coal effect fir, Coving to ceiling, Two panel radiators. Spacious room with an array of fitted eye and base level white shaker style units, with a roll top preparation surface incorporating a one and a half bowl stainless steel 'Franke' sink unit, mixer tap and dedicated drainage area, Halogen four ring hob with extractor above, oven and grill unit below. Space and plumbing for washing machine and dishwasher. Space for low level fridge and freezer unit. Tiled splashback and Italian tiled floor. UPVC double glazed window and door to rear aspect. Three piece suite comprising a walk in shower, pedestal wash hand basin and low level WC. Full height and floor tiling. Chrome ladder style heated towel rail. Three piece white suite comprising a corner bath with electric shower over, pedestal wash hand basin and low level WC. high gloss tiled flooring. Ladder style radiator. Full height contemporary splash wall, recessed down lighters, Single glazed frosted window to storm porch. Obscure Upvd double glazed window to side elevation, loft access, built in storage cupbaords, smoke alarm, doors to all rooms. UPVC double glazed window to front aspect. Built in wardrobes provide ample hanging and storage space. Storage in the eaves. Radiator. UPVC double glazed window to rear aspect. Storage in the eaves. Radiator. The front aspect of this delightful home provides off road parking for multiple vehicles and gives gated access to the rear offering a discreet refuse area. The south facing private and enclosed garden is predominantly laid to lawn with a patio area ideal for entertaining guests. A range of plants, trees and bushes provide all year round colour and texture. External power and water.